What does it mean to become a customer at RoboJob? When you purchase one of our Turn- or Mill-Assists, you will not only choose a product. You will also choose a partner who doesn't only understand the machining industry in all its aspects, but also thinks with you to offer you easy-to-use solutions. And you will choose a supplier. A supplier who offers you the best possible service. Together we strive to revitalize the profitability and competitiveness of our industry. By doing so we want to make our industry attractive again to highly skilled workers. Security: RoboJob has been able to help hundreds of companies with their search for automation solutions. And that is to your advantage. You can take advantage of our knowledge and experience. We originate from the manufacturing industry, and can also draw from the experience of hundreds of other companies in your industry. A low-threshold solution: simple concepts, which are easy to use. Flexibility in all possible ways: not only with our products but also with our people. Capacity on a limited surface: Thanks to our unique, patented stacking system, we succeed in creating surprisingly high capacity on a very small surface. Contact RoboJob and you’ll immediately have the answer to your question. 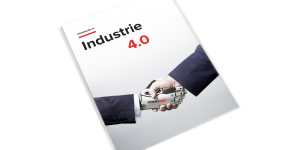 Industry 4.0 in the machining industry? May we welcome you at one of our tradeshows and events? This year, RoboJob will participate at the Machineering tradeshow in Brussels for the fifth time in a row. 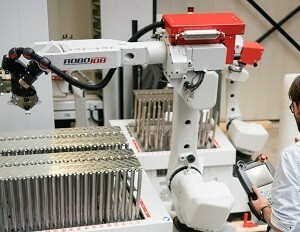 As always, you can discover the latest innovations in CNC Automation at the RoboJob booth. Register your visit. From 2 to 4 April 2019, the 'RIST' tradeshow will take place in Valence. You will find RoboJob at the stand of Degomme Boccard. Register your visit. Together with our partner Intermaher we take part in Advanced Factories in April. This annual exhibition focuses on industrial automation, CNC machines and the digital factory. Simultaneously with Advanced Factories, the Industry 4.0 Congress will also be organized at the same location. Do not miss this unique combination, and register your visit today. In June, RoboJob will participate at the Open House of EMCO GmbH in Austria for the first time. There we will set up our Turn-Assist 200i on an EMCO HT45 G3. Register your visit. On June 6 2019, Hommel Unverzagt will organize the "Technikforum": a workshop on modern automation in the production environment. And of course, RoboJob will also be present. Register your visit. On June 27, 2019 we will participate in the Open House of Mazak France in Villejust, near Paris. There we will show you our Mill-Assist Essential i, which will be set up on a Mazak VTC 760C. Register your visit. The EMO tradeshow in Hanover is the tradeshow for the European manufacturing industry. This year EMO will again take place in Hanover, and of course RoboJob cannot be missed! We will present you our latest innovations in CNC automation. Register your visit! Who is already a RoboJob customer? "Why should we let an experienced operator load and unload a machine, while there’s a robot to do this! " "We get twice as much output on this machine with automation, as on a machine with an operator!"